HERE you will find Mr. Wyatt's Assistant Pig Keeper. This totally kills. Thanks for making my day. i daresay this is one of my favorite pieces you've ever done!! do you seriously gotta do something this awesome? Nice. Ahh, this is freaking awesome! Wow! This composition rocks and it's crazy charming. Nice piece Anthony. Yes!!! I feel like a kid on christmas day. Kenji, I was pretty excited when I saw your last comment, because I had already planned this. Good timing! Sorry, I followed the link over to Jake's site and never came back, so you don't get a comment. Fun energy to this piece! really really awesome!! I love it! 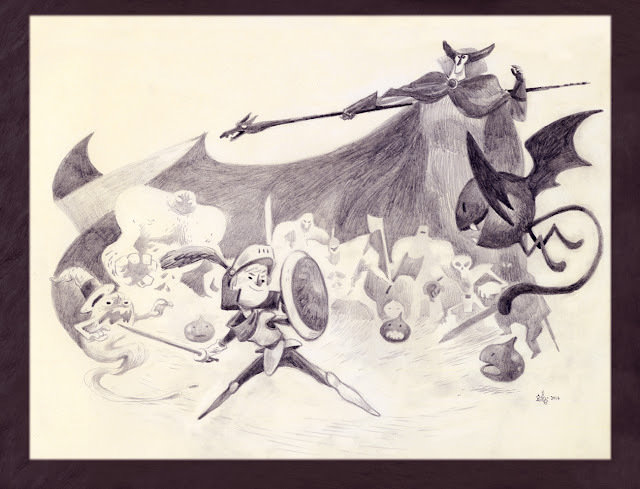 I dunno what this 'dragon quest' deally is, but i love this pencil illustration. great stuff. tony my man, you my hero bro. On My Trusty Bike Friday!